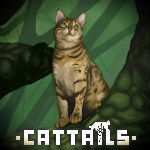 Kittens bug | Cattails: Become a Cat! Hello, I've been playing this game a while and when I got kitten's with Slip something was buggy about it. When the Kittens weren't able to stand up yet everything was fine but when they started standing up and I go outside or go to sleep, the kittens are again in their first "can't stand up yet" stage and you can't even click on them, it's like the game doesn't even recognise them. This happens again and again and because of that I'm not even able to get to three stars with them because it literally resets itself. I'm worried that this will now happen everytime I have kittens with someone. Is it normal that they still have the same form as in stage 1? and is its also "normal" that I can't reach star 3 no matter how many gifts I give them? Kittens take a long time to reach higher stars, so that shouldn't be too concerning. Just keep giving gifts! Thank you! I was really worried.